Katia Artesania Evita scarf knitting yarn with merino wool and fur like pom poms is a truly luxurious and very different, limited edition scarf knitting yarn. 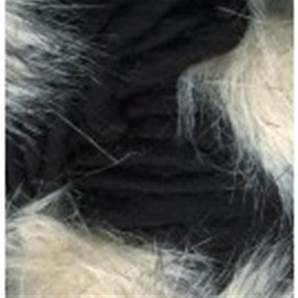 It's a skein of slubby merino wool, hand sewn with exceptionally realistic synthetic fur pom poms, and knits up fast to create a classy scarf or cowl - perfect for dressing up a plain top. 70% merino wool, 30% synthetic (polyester) fur, Katia Artesania Evita knitting yarn can be handwashed or dry cleaned. 100g, 60m, 66yds. With 15mm needles, cast on 8sts. Row 1: * K1, YO *, rep from * to * and end row with K1. Row 2: * K1, YO and drop wrap from previous row *, rep from * to * and end row with K1. Repeat these 2 rows throughout. When skein is nearly finished, cast off. With 15mm needles, cast on 18st. Slip the first st of each row as if to knit it if it is a purl st and the contrary if it is a knit st.